The proposed new park 90 minutes north of Seattle would cover 130 acres and provide a rare, mile-long beach walk in the Puget Sound area. A group of nature lovers north of Seattle is scrambling to pull off a rare feat in the densely populated Puget Sound region: creation of an expansive, new waterfront park. 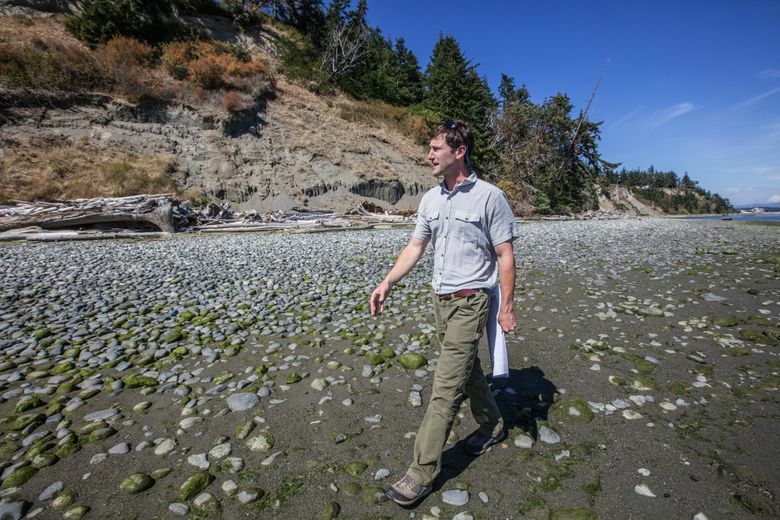 If the Whidbey Camano Land Trust succeeds in its mission, nearly 130 acres of privately held forest, bluffs and beach will be open to the public for the first time since settlers acquired the property in the early 1900s. The future park would include more than 2.5 miles of forested trails and a mile-long stretch of wild beach. Mount Baker dominates the horizon to the north, while the view to the east takes in the broad expanse of Port Susan Bay, where the Stillaguamish River spills into the Sound. 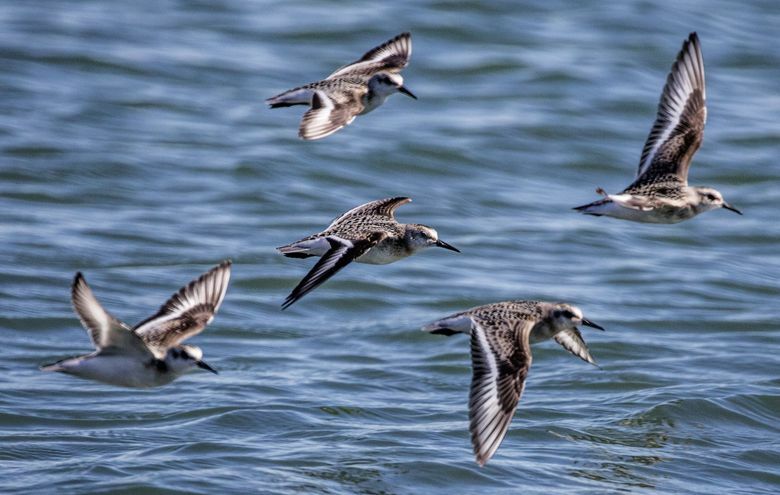 A 90-minute drive from Seattle, Barnum Point is a key stopover for migratory shorebirds. Bald eagles and herons nest in the firs and cedars that cap bluffs up to 10 stories tall. When the tide is out, it’s not uncommon to see several eagles out on the mud flats, Elting said. The point and bay are also part of what fisheries biologists call the “bed-and-breakfast” for juvenile salmon from throughout Puget Sound, said Marc Duboiski, a grants manager for the state’s Salmon Recovery Funding Board. 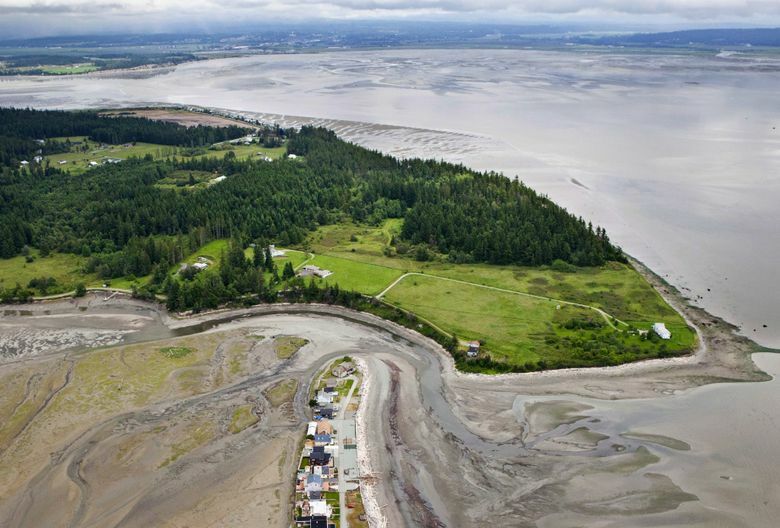 The combination of gravel beds, undeveloped beach and acres of eel grass provide places for young salmon to rest and feed, as well as offering habitat for forage fish like sand lance, smelt and herring. That’s why preservation of the area ranks high among his agency’s priorities, Duboiski explained. But cobbling together a new park is a complicated business. All of the land is owned by the descendants and extended family of Sterling Jones Barnum, a New Yorker who bought the property in 1904. 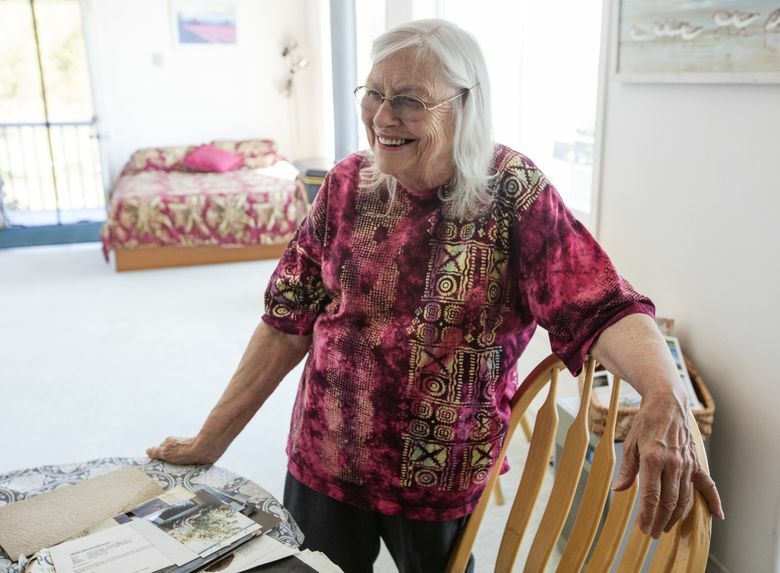 He built a rustic home near the point and made a living farming and raising sheep, said his granddaughter Carolin Barnum. “They basically lived off the land,” she said. At the age of 82, Barnum still operates the Inn at Barnum Point, a bed-and-breakfast that’s one of the few structures on the property. Family members are eager to see the land protected, said Barnum, whose father was born there in 1905. She grew up in Seattle but visited the farm on weekends and holidays, camping in lean-tos and roaming the forests and beaches. The land trust started working on the project in 2010 with the goal of eventually buying the entire 129 acres at an estimated cost of about $6 million. One 27-acre parcel has already been acquired for a county park, and the group took out a short-term loan to secure an additional 35 acres. With cooperative owners who aren’t in a hurry to sell, the land trust expected to have ample time to raise the rest of the money through grants and donations. But a bankruptcy has injected an unexpected element of urgency, Elting explained. Barnum’s cousins, who own 37 acres, were forced to file for Chapter 11 bankruptcy after defaulting on a loan secured by the property. The court ordered the land sold. Now, the land trust faces a Sept. 6 deadline to raise the $1.1 million asking price before the property is offered to private buyers. Donors have anted up nearly 80 percent of the money, starting with $10,000 from students at Stanwood High School. That leaves a $236,000 gap to fill in a short time. Elting is nervous, but optimistic. “I feel like we’re going to make this happen,” he said. 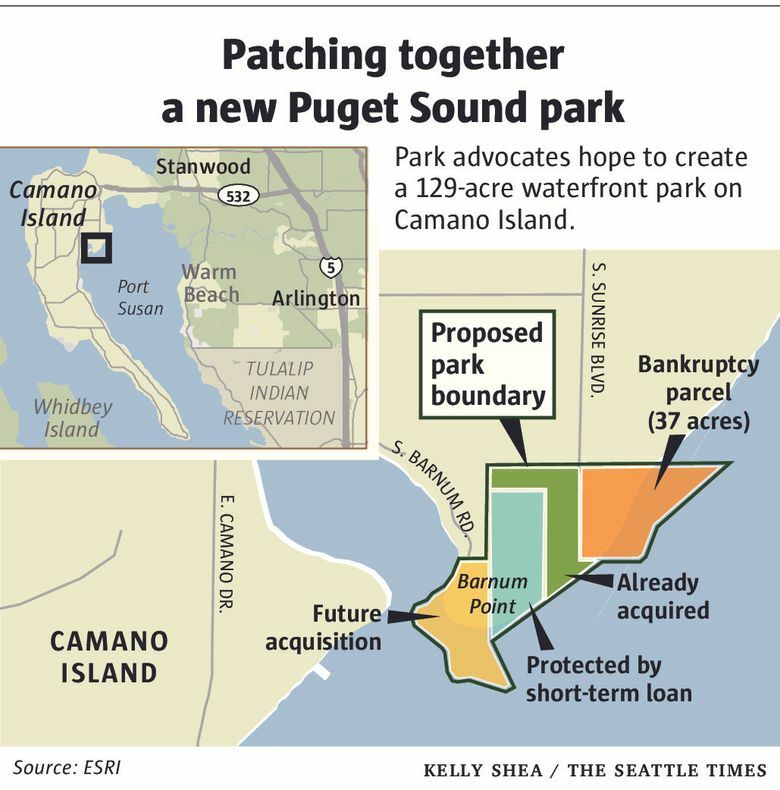 There’s strong support for parks and land preservation across Camano and Whidbey Islands, said Bill Oakes, county parks director. Thanks largely to public support and cooperative landowners, the Whidbey Camano Land Trust has protected 8,300 acres since its founding in 1984. Though it’s not yet open to the public, the county has started improving trails and developing access points to the block of land already acquired by the land trust and its allies. If the rest of the land follows, all of the existing structures — including the Inn at Barnum Point — would eventually be demolished, Oakes explained. For Barnum, who has lived on the site for more than 20 years, that’s a bittersweet prospect. It’s possible she could work out a deal with the trust to allow her to stay at the point as long as she wants. But even if that doesn’t happen, she’s happy knowing her granddaughter and other family members can continue visiting the area when it’s a public park. More information on the project is available at www.wclt.org/projects/barnum-point.